This dental malpractice claim was filed in Montgomery County after a woman sustained nerve damage during a procedure to replace her broken bridge with dental implants. It was filed in Health Claims Arbitration on January 19, 2018, and it is the 34th medical malpractice case filed in Maryland this year. A woman presented to the dentist with a broken mandibular three-unit bridge (a dental prosthesis supporting three bottom teeth) on the left side of her mouth. Her dentist extracted tooth #20 and placed implants at teeth sites #19, 20, 29, and 30. Following the procedure, the woman returned to the dentist's office complaining of lower right chin numbness on three separate occasions, a result of inferior alveolar nerve damage. The dentist prescribed Decadron, a steroid. Three months after the tooth extraction an implant placement, the dentist removed the woman's implant at site #29. The dentist claimed to have prescribed Medrol Dosepak, a different steroid, and referred the woman to a neurologist. Hoping that the numbness and tingling would go away, the woman asked to have the implant at site #30 removed about four months after its initial placement. The chin numbness and tingling persisted and appears to be permanent. Apparently, 2018 is the year of the dental malpractice lawsuit. This is eight dental malpractice lawsuits in 11 days. This increases the number of filed malpractice lawsuits which fans the flames of those who claim there are too many malpractice lawsuits. We are going to start keeping track of how many dental cases are filed because they really are a different animal from regular malpractice lawsuits. No one is out there claiming there are too many dental malpractice lawsuits. The truth is until this year dentists did not get sued enough. The inferior alveolar nerve (IAN) runs just above the jawline in the "mandibular canal," supplying the bottom teeth. IAN location within the mandibular canal can differ slightly from person to person, so it is important for dentists to visualize the IAN's exact location in each individual patient before attempting a procedure. 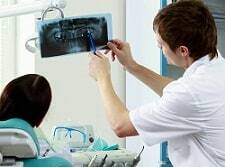 In most cases, dental x-rays are sufficient. IAN injuries can occur when local anesthesia is injected before a dental procedure, but the most severe IAN injuries are caused by implants and implant drills. In addition, performing an implantation immediately after a tooth extraction can sometimes cause nerve damage. This claimant was exposed to all three possible causes of injury. Mazza Center for Implant and Aesthetic Dentistry, P.C. Failing to refer the claimant to an oral surgeon or periodontist for the implant placement. Failing to remove the negligent implants in a timely manner, as soon as it became apparent that the claimant's inferior alveolar nerve was injured. Failing to administer steroids and refer the claimant to an oral surgeon specializing in nerve repair as soon as the nerve injury was ascertained. As a result of the dentist's negligence, the claimant sustained a nerve injury that keeps an area of her mouth and chin numb.